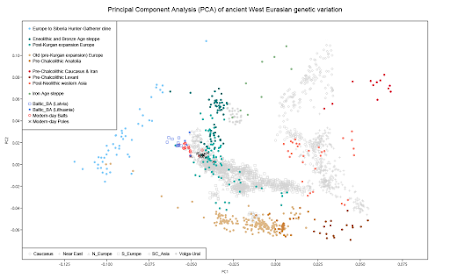 Below is a Principal Component Analysis (PCA) that I put together for an upcoming presentation on Polish ancient DNA (aDNA). The five RISE samples are from Allentoft et al. 2015, including RISE569, the early Slavic genome from the Czech Republic, which was initially wrongly labeled as a Czech Bell Beaker (see here). PL_N17 is an Early Bronze Age (EBA) sample from Gustorzyn, Northern Poland (see here). I also organized f3 outgroup statistics of the form f3(European_pop,Test,Yoruba) for each of these samples to compare their genetic affinities to present-day European populations. 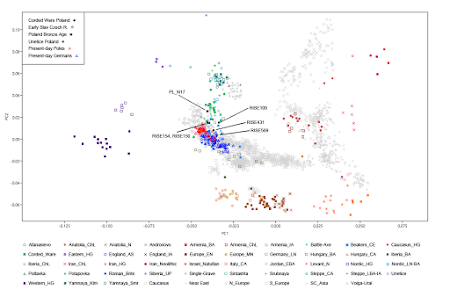 Although f3 outgroup statistics aren't as sensitive as haplotype tests, I think these results look interesting and useful, with both PL_N17 and RISE569 seemingly showing strong links to modern-day West Slavs. The full output is available in a zip file here. Abstract: The structure and diversity of mitochondrial DNA (mtDNA) macrohaplogroup U lineages in Russians from Eastern Europe are studied on the basis of analysis of variation of nucleotide sequences of complete mitochondrial genomes. In total, 132 mitochondrial genomes belonging to haplogroups U1, U2e, U3, U4, U5, U7, U8a, and K are characterized. 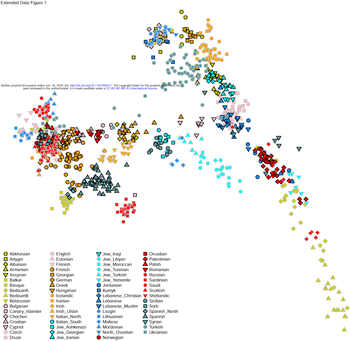 Results of phylogeographic analysis show that the mitochondrial gene pool of Russians contains mtDNA haplotypes belonging to subhaplogroups that are characteristic only of Russians and other Eastern Slavs (13.7%), Slavs in general (11.4%), Slavs and Germans (17.4%), and Slavs, Germans, and Baltic Finns (9.8%). Results of molecular dating show that ages of mtDNA subhaplogroups to which Russian mtDNA haplotypes belong vary in a wide range, from 600 to 17000 years. 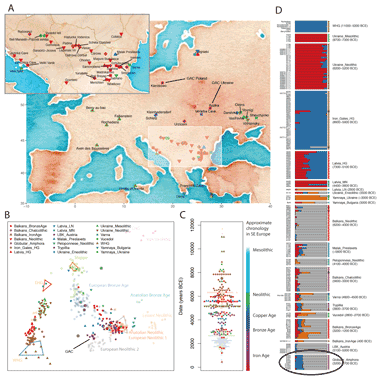 However, molecular dating results for Slavic and Slavic-Germanic mtDNA subhaplogroups demonstrate that their formation mainly occurred in the Bronze and Iron Ages (1000–5000 years ago). Only some instances (for subhaplogroups U5b1a1 and U5b1e1a) are characterized by a good agreement between molecular dating results and the chronology of Slavic ethnic history based on historical and archaeological data. Abstract: For thousands of years human beings have resisted life-threatening pathogens. This ongoing battle is considered to be the major force shaping our gene pool as every micro-evolutionary process provokes specific shifts in the genome, both that of the host and the pathogen. Past populations were more susceptible to changes in allele frequencies not only due to selection pressure, but also as a result of genetic drift, migration and inbreeding. In the present study we have investigated the frequency of five polymorphisms within innate immune-response genes (SLC11A1 D543N, MBL2 G161A, P2RX7 A1513C, IL10 A-1082G, TLR2 –196 to –174 ins/del) related to susceptibility to infections in humans. The DNA of individuals from two early Roman-Period populations of Linowo and Rogowo was analysed. The distribution of three mutations varied significantly when compared to the modern Polish population. The TAFT analysis suggests that the decreased frequency of SLC11A1 D543N in modern Poles as compared to 2nd century Linowo samples is the result of non-stochastic mechanisms, such as purifying or balancing selection. The disparity in frequency of other mutations is most likely the result of genetic drift, an evolutionary force which is remarkably amplified in low-size groups. Together with the FST analysis, mtDNA haplotypes' distribution and deviation from the Hardy-Weinberg equilibrium, we suggest that the two populations were not interbreeding (despite the close proximity between them), but rather inbreeding, the results of which are particularly pronounced among Rogowo habitants. Although no sound evidence of population differentiation was found when comparing the samples of Linowo and Rogowo, it is worth noticing that the distribution of mtDNA haplotypes between these two settlements differs remarkably. Apart from the two haplotypes (rCRS and 16126C) that occur in both studied groups, no other pattern of mtDNA SNPs is shared between them. The lack of reflection of these dissimilarities in the FST analysis is probably a result of the low-size group which is more exposed to result bias or low diversity of haplotypes among Rogowo individuals. All of the above allows to draw the theoretical conclusion that although these two settlements date back to the same period and are located within 55 km (or around 160 km along the Vistula River) of one another, they are genetically remote. Huge difference in this ADMIXTURE bar graph from the recent Pankratov et al. paper between Lipka Tatars from Belarus and nearby Balts and Slavs. The Lipka Tatars are almost identical to Volga Tatars despite residing in their current homeland for about 500 years. I'm guessing the fact that they're Sunni Muslims might have something to do with it. Pankratov, V. et al. 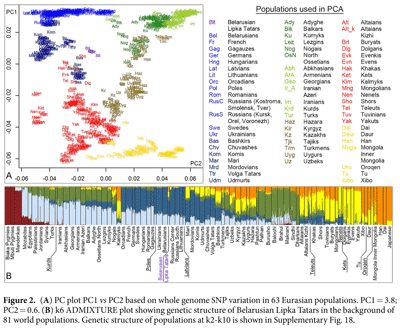 East Eurasian ancestry in the middle of Europe: genetic footprints of Steppe nomads in the genomes of Belarusian Lipka Tatars. Sci. Rep. 6, 30197; doi: 10.1038/srep30197 (2016). Harvard's Human Origins dataset is being updated with 238 new samples, including 23 from Poland (15 from Poznan in western Poland and 8 from Lublin in eastern Poland). It should be available for download soon at the Reich Lab website here, although many of the new samples will only be accessible to people who sign a waiver. 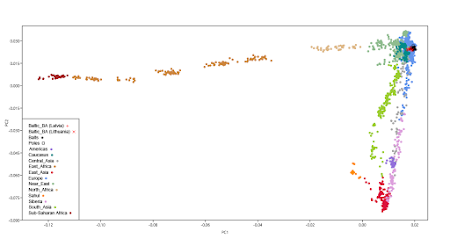 Below is a Principal Component Analysis (PCA) from Lazaridis et al. 2016 featuring the new samples. Interestingly, most of the Poles, probably those from Poznan, cluster with Sorbs from eastern Germany. This ESHG 2016 presentation about Danish population structure is sure to be interesting. 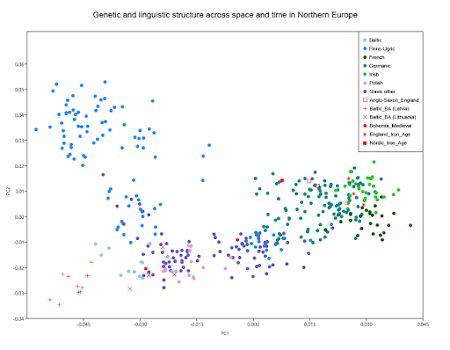 I wonder how the authors were able to discern ancient Polish admixture from more recent Polish admixture? Keep in mind that lots of Poles settled in Denmark during the past 150 years or so. For instance, former Danish national team goalkeeper Peter Schmeichel is half Polish. And Caroline Wozniacki is totally Polish. Abstract: Denmark’s genetic history has never been studied in detail. In this work, we analysed genetic and anthropometrical data from ~800 Danish students as part of an outreach activity promoting genomic literacy in secondary education. DNA analysis revealed remarkable homogeneity of the Danish population after discounting contributions from recent immigration. This homogeneity was reflected in PCA and AMOVA, but also in more sophisticated LD-based methods for estimating admixture. Notwithstanding Denmark’s homogeneity, we observed a clear signal of Polish admixture in the East of the country, coinciding with historical Polish settlements in the region before the Middle Ages. In addition, Denmark has a substantially smaller effective population size compared to Sweden and Norway, possibly reflecting further lack of strong population structure. None of these three Scandinavian countries seems to have suffered a depression due to the Black Death in the Middle Ages. Finally, we used the students’ genetic data to predict their adult height after training a novel prediction algorithm on public summary statistics from large GWAS. We validated our prediction using the students’ self-reported height and found that we could predict height with a remarkable ~64% accuracy. Update 24/08/2016: The paper is now available at Genetics and open access. See here: On the remarkable genetic homogeneity of Denmark. The genetic evidence presented in this paper is underwhelming; a single, low resolution mtDNA haplogroup I haplotype that appears to be of Scandinavian origin because it was also found in remains from Iron Age Denmark (sample B5 in Melchior et al. 2008). However, the authors' conclusions are also based on archaeological evidence, and they also match recent isotopic results (see here). Abstract: Contemporary historical anthropology and classical archaeology are concerned not only with such fundamental issues as the origins of ancient human populations and migration routes, but also with the formation and development of inter-population relations and the mixing of gene pools as a result of inter-breeding between individuals representing different cultural units. The contribution of immigrants to the analysed autochthonous population and their effect on the gene pool of that population has proven difficult to evaluate with classical morphological methods. The burial of one individual in the studied Napole cemetery located in central Poland had the form of a chamber grave, which is typical of Scandinavian culture from that period. However, this fact cannot be interpreted as absolute proof that the individual (in the biological sense) was allochtonous. This gives rise to the question as to who was actually buried in that cemetery. The ancient DNA results indicate that one of the individuals had an mtDNA haplotype typical of Iron Age northern Europe, which suggests that he could have arrived from that area at a later period. This seems to indirectly confirm the claims of many anthropologists that the development of the early medieval Polish state was significantly and directly influenced by the Scandinavians.